Scientific Name: Bassella alba Linn. In Thailand, this vegetable is known as the vegetable of rural people , because they grow wild as a green climbers. I learned to know about them after I finished my college. For some reason I was not aware of them in my childhood. Pak-Plang is how we call this Ceylon Spinach. Even though they bear the name spinach, they are actually climbers. If they have nothing to climb on the will climb on themselves and form a small bush. There are 2 types of Ceylon Spinach, one with green stalk and one with the dark purple that we call red Ceylon spinach. I see no difference between the two of them except the color. They bear flower that are also good in sour soup with fish. 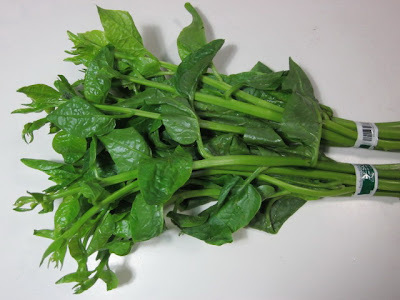 Ceylon Spinach contains many important vitamins and minerals, especially vitamin A. In 100 Grams, Ceylon Spinach contains 9,316 IU.